A good miter saw is a staple item for your workshop. Woodworkers produce a variety of products in numerous styles which entails the ability to make cuts at any angle. A top rated miter saw enables workers to do just that. 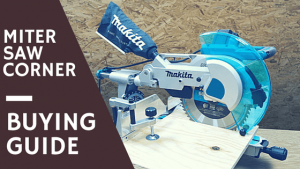 Buying a miter saw can be a daunting task though, but this is where my comprehensive buying guide comes in to make your decision easier. This power tool has an oscillating swing arm that can be adjusted to aim the blade left or right to produce a desired angled cut. If you’re looking to make flawlessly straight, splinter-free cuts this tool is an essential. Do you need a saw with a laser guide? Is a sliding or compound miter saw better? Where to buy miter saws? Which miter saw to buy? Have you ever seen seamless crown molding or immaculate, custom trim? If so, there was likely a miter saw involved in the creation. Items with joints made between two or more pieces of wood such as picture frames, window or door frames, furniture, or even decks are also products of a miter saw (also sometimes referred to as a chop saw). On top of creating precise, crisp angles the saw is also convenient for making a lot of quick cuts if one needs numerous small pieces made up. Measurements are made easy as the saw is labeled making the learning process very straightforward. Now, let’s cut into some details! There are a few different sizes of blades and brands (including Dewalt, Makita and Hitachi) to be aware of before making a purchase. Here are the basics of miter saw buying. Blades typically come in 10 or 12-inch sizes. Deciphering between which saw to purchase is dependent on your use cases. However, unless you have a frequent need for a 12-inch blade a safe bet would be to buy a 10-inch. The 10-inch option: At most hardware stores there will be a larger selection of 10-inch blades that you will also find to be less costly. Not only is the upfront costs less, but fewer teeth means these blades are also less expensive to sharpen. The smaller radius allows the blades to spin faster using fewer amps ultimately driving down the cost of electricity, too. A good 10 inch option is the DW717 made by Dewalt. The 12-inch option: The benefits of the 10-inch saw do not always outweigh that of the 12-inch. Bigger blades mean longer cuts. These tools also use more amps so they drive more power into the cuts. This is ideal for tasks like deck building or projects that use thicker material. Higher tooth speed also means cleaner, sharper cuts. A 12inch saw I really like is the DWS780 from Dewalt. Purchasing a laser for your miter saw would be a good idea if you if a project requires accurate cuts. Laser essentially act as a guide by shining a beam onto the material where the blade will hit upon lowering. This way, a woodworker will know precisely where the blade will cut before contact is made. This decreases the risk of error and is a safer way to use the tool. Keep in mind the laser is harder to see under bright light, so this is best for indoor use. Again, when determining which type of miter saw to buy you need to consider what you will be using it for. If you are creating simple things that require angled cuts in two planes (like picture frames, or crown molding) you will want a compound saw. These miter saws can pivot left to right and can create a compound cut in one easy pass. Sliding miter saws differ from compound saws because they can also move forwards and backwards. This allows woodworkers to increase the length of a cut. They can do all that a compound saw can do and can cut up to 16-inches thick. This is ideal for lumber, boards, or logs. So, now if you know what type and size miter saw to buy, the last thing you need to know is which brand to choose. A quality woodworker needs a reputable tool! My recommendation is only buy from Amazon. Their range and service are the best in my opinion. Sure, you can walk into your local hardware store, or a Home Depot\Lowes, but Amazon regularly offers miter saws for sale at some of the lowest prices you will find online. If you have been wondering what miter saw to buy, you are definitely in the right place. Now that you have seen all the different angles of miter saws, it’s time to start thinking about which miter saw table and blade you want to use.